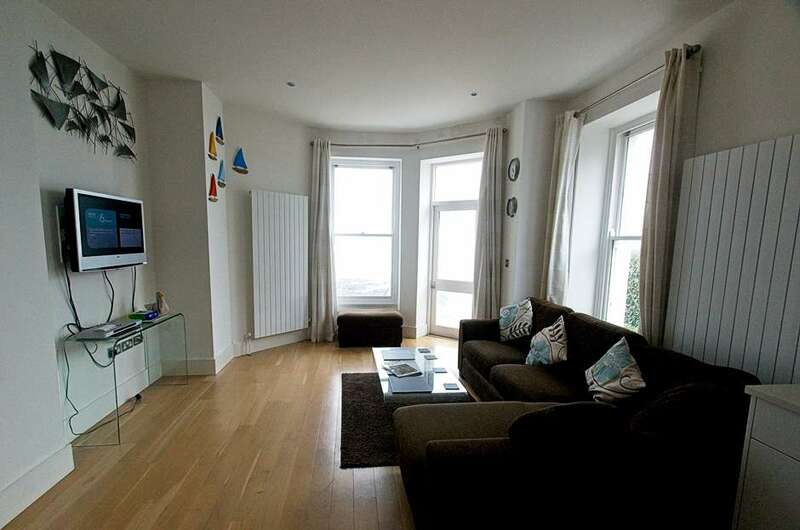 Location, location, location…another wonderful seafront apartment at the much sought after Little Beach. Directly opposite the beaches of Woolacombe Bay, this stunning ground floor 3 bedroom apartment looks over Barricane and Woolacombe's main beach. The communal entrance leads to stairs down to Apartment 2 which is on the ground floor. An additional entrance on the ground floor has steps down to the Esplanade and Beaches. The Apartment itself is on one level, sleeping 6 with a king-size bedroom with en-suite shower room, a twin bedroom with en-suite shower room, a double bedroom and a full size family bathroom. The master bedroom has the most spectacular uninterrupted views over the private terraces to the beach and sea beyond through a series of 4 large sash windows. The lounge/kitchen area is open plan with the kitchen having at a full-size dishwasher, washer/dryer, oven, hob & extractor, fridge, freezer and microwave. The sunny living area is dual aspect with two large sash windows and a glass door onto the terraces. There is an “L” shaped corner sofa, dining table and chairs, coffee table, TV/DVD and Wi-Fi. Outside there is a split level private terrace with a table and six chairs. From here you can sunbathe as well as enjoy outdoor dining whilst watching the often spectacular sunsets over Lundy and Morte Point. Within the communal area of the building there is a surfboard store and the external doors have an intercom system. There is an allocated parking space for one car and additional visitor spaces. Little Beach is an extremely popular eight apartment development situated along Woolacombes Esplanade and just over the road to the well known and loved little shell beach of Barricane with it’s fabulous seasonal café.